현재 극락보전에 봉안되어 있는 목조아미타여래좌상은 1657년에 영규(靈圭)와 조능(祖能) 등이 조성한 불상이다. 현재 영규가 조성한 다른 불상은 조성한 예가 확인되지 않지만, 조능은 1640년 법영(法靈)이 수화승을 맡아 제작한 전북 옥구 불명사 목조불좌상의 조성에 참여하고, 1655년에는 수화승을 맡아 전북 전주 봉서사 목조관음보살좌상(전라북도유형문화재 제156호)을 조성하였다. 이 상은 타원형의 원만한 상호에 신체는 허리가 길고, 어깨는 넓고 완만한 어깨선을 갖추었으며, 결가부좌한 다리는 높이가 낮고, 폭이 넓어 전체적인 비례가 알맞고 안정감이 있다. 수인은 하품중생인을 결하였는데, 왼손은 손바닥을 위로 오른손은 손등을 위로 하여 중지와 엄지를 맞대었다. 나발을 표현된 머리에는 육계가 구분이 불분명하게 낮고, 육계의 경계에는 반달형의 중간계주를, 정수리에는 원통형의 정상계주를 표현하였다. 상호는 타원형으로 이마가 좁은 편이며, 이목구비는 반개한 눈이 길고 위로 치켜 올라가 눈매가 날카로우며, 초승달형의 눈썹과 오똑한 코, 가늘고 길게 표현된 입술은 그 끝이 살짝 올라가 미소를 머금고 있다. 미간에는 백호를 돌출되게 표현하고, 목에는 삼도의 흔적을 얕게 표현하였다. 법의는 이중으로 걸쳐 입은 방식이다. 오른쪽 어깨 앞쪽으로 살짝 걸쳐 내린 대의는 끝단이 약간의 곡선을 이룬다. 결가부좌한 다리를 덮은 군의는 발목 아래로 흘러내리는데 양측으로 서너 개의 주름으로 나누어 정리하였다. 이 불상은 군의 주름과 오른쪽 다리 소매 자락의 표현이 매우 특징적인데, 다리 중앙에서 수평으로 부채꼴 모양으로 주름을 이루는 것이나 무릎 좌우의 주름이 각기 다른 점 그리고 왼쪽 무릎 뒤에 놓인 좁은 소맷자락이 무릎에 밀착되어 흘러내려 승각기의 안쪽으로 들어가게 표현하였지만 소매자락이 몸에 밀착되지 않게 표현한 점 등은 이 불상의 특징이라 할 수 있다. 법인사 아미타여래좌상은 경상남도 유형문화재로 지정할 당시 발원문과 복장 유물이 확인되었으나 발원문은 현재 불상에 다시 납입한 것으로 추정되며, 발원문을 제외한 묘법연화경과 보협인다라니, 복장 마개 등의 복장 유물은 현재 해인사성보박물관에 위탁 보관중이다. 법인사 아미타여래좌상은 이 시기 불상 중에서 조각적 완성도도 비교적 높다. 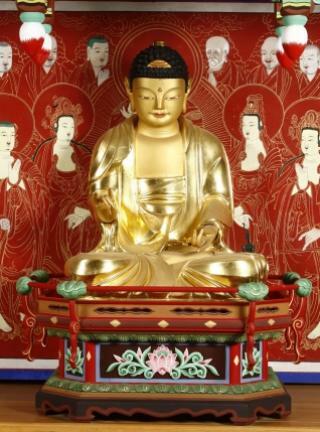 The Wooden Seated Amitabha Buddha housed in Geungnakbojeon Hall of Beobinsa Temple was created in 1657 by Yeonggyu and Joneung. 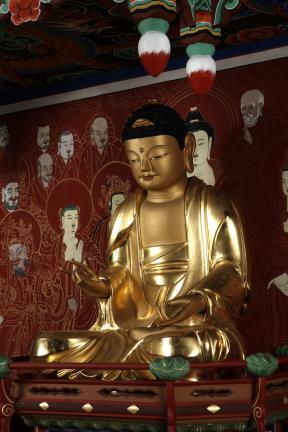 While no other work by Yeonggyu is currently known, Joneung participated in the carving of the Wooden Seated Buddha of Bulmyeongsa Temple in Okgu, Jeollabuk-do, created in 1640, under a project led by Beopyeong, and was the head sculptor for the project of creating the Wooden Seated Avalokitesvara Bodhisattva of Bongseosa Temple in Jeonju, Jeollabuk-do (1655, Jeollabuk-do Tangible Cultural Heritage No. 156). 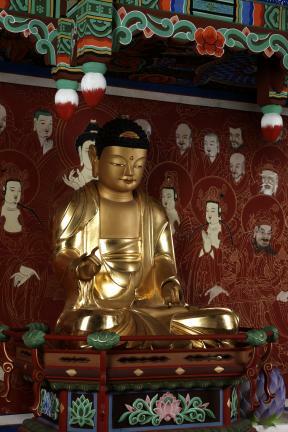 This statue of Amitabha Buddha flaunts a good natured-looking oblong face. The broad shoulders, above a long torso, have rounded angles. 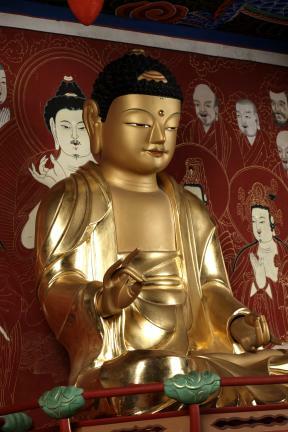 The size of the lower body of the seated Buddha is in proportion to the upper body; the legs are large and voluminous enough and are positioned low, close to the throne. The mudra assumed is hapum jungsaengin (a variety of the vitarka mudra). The left hand is positioned so that the palm faces upward, and the palm of the right hand faces downward. The tall finger and the thumb are joined in both hands. The ushnisha on top of the head covered with conch-shaped hair curls is low-rising and is not very distinct. Around the bottom of the ushnisha, there is a crescent shaped cudamani, and at the top of the ushnisha, a cylindrical-shaped cudamani. The forehead in the oblong-shaped face is rather narrow. The half-closed eyes are slanted with their outer tips sharply pointed upward, and the eyebrows are arched like a crescent. The nose is well-defined, and the thin and long lips have their corners curled upward, into a faint smile. Between the eyebrows, there is the tuft of white hair (urna), and the neck shows three curved lines, another marker of Buddhahood, in shallow incised lines. The Buddha is dressed in two layers of clothes. The robe, hanging lightly from the right shoulder, drapes into a slightly curved hemline. The bottom garment covering the crossed legs flows down below the ankles, forming three to four folds on either side. This statue is highly peculiar in the way the folds of the bottom garment and the folds of the sleeve spread on the right leg are rendered. The folds on the two crossed legs are in arched lines like the arch of a handheld fan, but those to the left and right sides of the knees are not identical in shape. Meanwhile, the long narrow left sleeve flows down behind the left knee, in a position very close to the knee, to disappear beneath the top garment. This sleeve appears, at the same time, to fit snugly; a small but interesting detail that sets this statue apart from others. 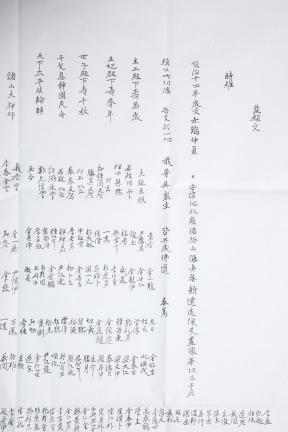 When the Wooden Seated Amitabha Buddha of Beobinsa Temple was designated as a Gyeongsangnam-do Tangible Cultural Heritage object, a prayer scroll was listed among the votive objects found inside it. This prayer scroll, however, appears to have been put back inside the statue thereafter. Other votive objects, including the Saddharmapundarika Sutra (The Lotus Sutra), the Casket Seal Dharani and the plug for sealing the hole on the back of the statue after placing votive objects are currently held in the Seongbo Museum of Haeinsa Temple, on a temporary custody basis. The Wooden Seated Amitabha Buddha of Beobinsa Temple is one of the better examples of Buddhist sculptures from this period.